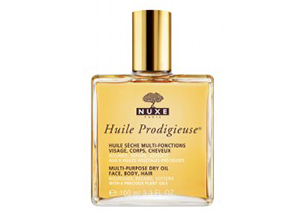 This multi-usage dry oil, made using six Precious Plant Oils (Macadamia, Hazelnut, Borage, Sweet Almond, Camellia and St. John’s Wort), nourishes, repairs and softens skin and hair. It has a unique dry oil texture and a captivating fragrance. I use this product primarily as a body oil, but also on my hair and face. I always receive compliments about the fragrance, and it leaves my skin feeling nourished and silky. The scent can be overpowering and I use it as a hair mask. Works wonders!